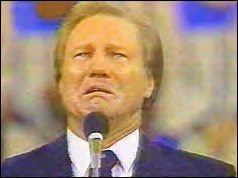 TV evangelist Jimmy Swaggart, famous for going before his audience in the 1980s to beg forgivness after being caught with a prostitute saying, "Oh Lord, I have sinned against you." Swaggart is parodied in this episode of MWC. Last edited by Dr. Shoe on Thu Mar 10, 2011 5:49 am, edited 1 time in total. Dr. Shoe wrote: TV evangelist Jimmy Swaggart, famous for going before his audience in the 1980s to beg forgivness after being caught with a prostitute saying, "Oh Lord, I have sinned against you." Daniel wrote: Thanks for that info! 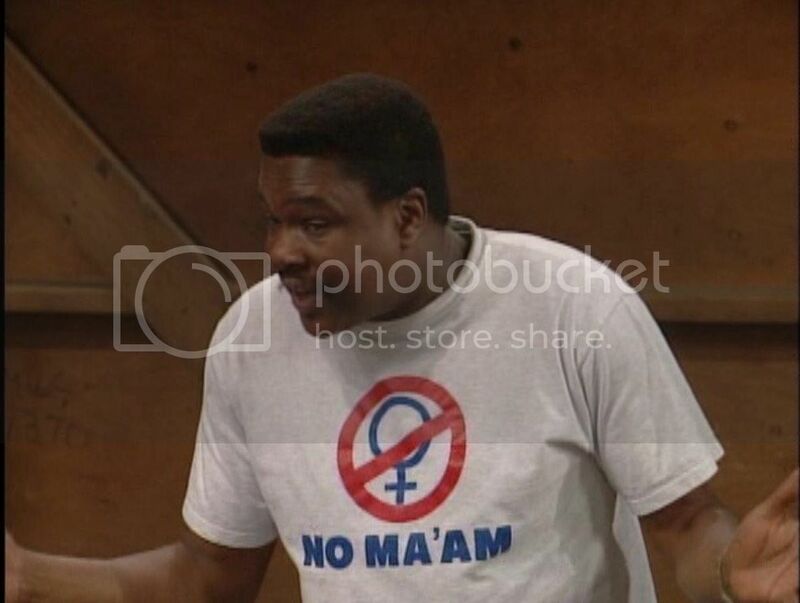 Ditto! I didn't know that, it makes it even more funny now! This is a F I V E, easily. 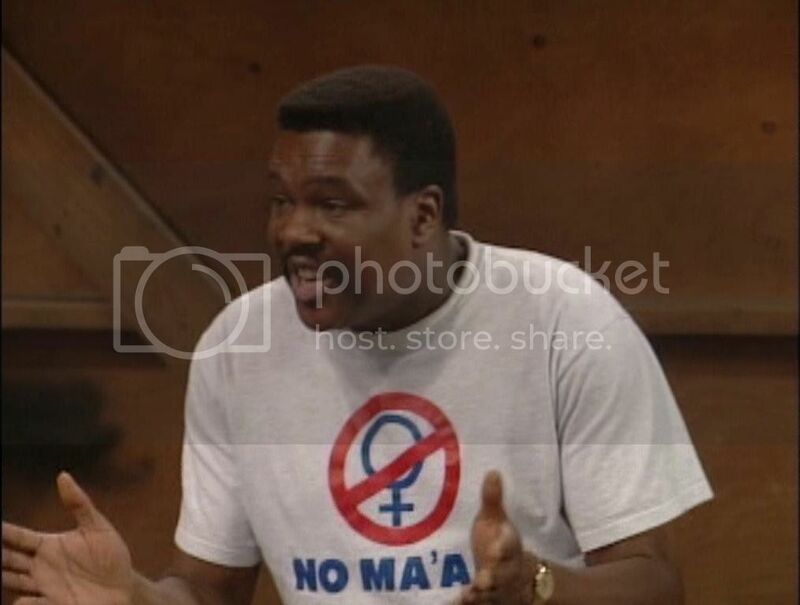 Al and the NO MA'AM group starts a church to get cheaper beer, receives a note from B. Clinton, Al in that hairdo. I DARE anyone to NOT give this one a five star rating! Yes five stars! Yeah that Elvis haircut and that outfit are so funny. "I'm not talking about that unleaded, eco-friendly, tree-hugging, girlie, jiggling money...I'm talking about beer-guzzling, truck-driving, low-riding, belching, fighting, FOLDIN' MONEY!" So I've been rewatching all the episodes as I purchased a cheapie box set off on Ebay. The dvd disks are from Millcreek Direct if that means anything. I've noticed a couple of time's where someone's shirt is blurred out, so I am guessing that was done after the original airings on FOX. Okay so I'm watching this episode and I notice something written on the inside of the garage door. Being a fan like the rest of you I immediately recognize MWC 1370 to the lower left of Griff as an abbreviation for something. It's a bit easier to make out when the shows playing. In the very next scene back to Griff it's spray painted out! Now I know this is not "huge news", but I'm curious if the original airing had this or was it done for the DVD release? And if so why block it out? Hey nice catch! Makes me wanna watch all the versions I have... wish I had an original FOX version. I guess the Mill Creek release had someone go through the episodes to remove anything noticeable like that. Think you are the first who has noticed that. I'll check that later in my DVDs. (Maybe the Episode is in more than one). Same here on my DVD Set. I'd guess it's some kind of an inventory number. Maybe the inside view of the garage door is seen in other episodes. Looks to me like somebody noticed during filming and spray painted it out. It's crazy after all these years there's still hidden Easter Eggs to be found! Happy you fellas replied btw. I'm gonna have to follow up and see if there's black spray paint on any future episode's or if was done digitally by the DVD manufacturer. If we didn’t notice it till now, a DVD manufacturer did not notice it, no way. I don't know how you guys do it. I'd have never noticed that......ever! Anyway, it won't stop me form giving this 4 stars.